The political-liberal blogger Pleym hath some opinions on freedom, laws and Ghandi-style smuggling and partying. While he don't acctually agree with norwegian liberal party Venstre, thats the party he is a member of. In the coming election freedom-minded electors should ponder on the fact that freedom-extremists choose this party and not the other "liberal" party, FrP. I have great hopes for Venstre - once the current leadership is either removed, or start fighting their political battles in the brave new world the rest of us are living in, they just might become a party for the generations of free souls our struggles have won us from the eigthies and up. 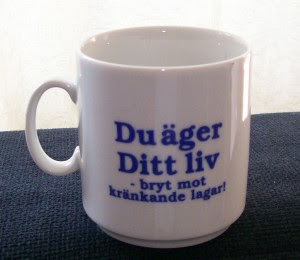 Swedish text: You own Your life - break demeaning laws!